All of you know to create daily statistics and also monthly statistics using php and mysql. You can also create yearly statistics using php and mysql. The php and mysql allows user to create charts on daily, monthly and yearly charts between two years. 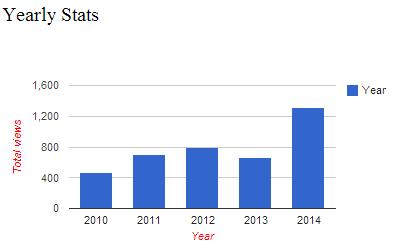 Due to this yearly stats, you can find how much your website got viewed and also find comparison of number of visits. You need to follow the below steps to create yearly stats using php. First you have to create table for update values. Now the table is created with fields view and date. Then you add the number of views to mysql table using php. Add the following code to header of each page in your website. Because header is in all pages. So you can easily calculate the number of views of your website. Due to this code, you can find total number views of your website per day. - select * from stats where date IN (CURDATE()) is select the views if present in current date. - mysql_num_rows() return the number of rows selected. If it is 0, then value inserted into mysql table. Otherwise values are updated. The following MySQL query is used to find total number of views of your websites per yearly. is select the number of views monthly. Now you can calculate the number of views of your website yearlly.